When Do You Clean Out Bluebird Houses? Birdhouses give birds a place to roost and to raise their young while attracting desirable birds to your garden. Some birds use the nests only once a year for a single brood, while other birds use them for two broods or simply roost in them throughout the year. Birds are messy when they are nesting, and it is important to clean your birdhouses regularly to prevent the spread of disease and to make the birdhouse more inviting. Clean birdhouses to keep them ready for future roosters. Watch the birds in the nest and clean the nest whenever you notice that the most recent crop of nestlings has matured and left. 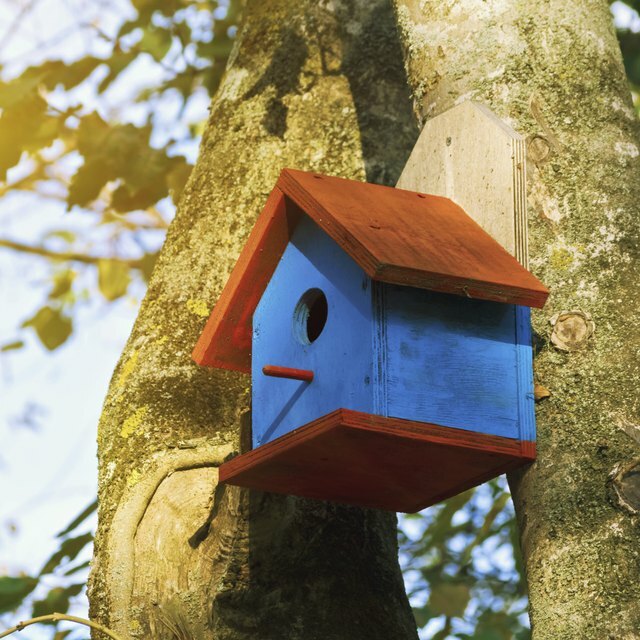 A birdhouse should be cleaned at least once a year, but ideally, clean it every time a group of nestlings departs. This prevents the spread of disease and parasites from one nest to the other and it also cuts down on the chance of parasites spreading through to the tree or your property. A wooden birdhouse is swollen after the rain. Allow the birdhouse to dry for a few days in the sun before you attempt to clean it. This makes dismantling the birdhouse significantly easier and you will not risk breaking the birdhouse by forcing the parts. To clean out a birdhouse, use bleach and water. To be fully prepared, wear rubber gloves and a breathing mask, as the nest may be dry and send up spores or fumes that are harmful to you. The gloves protect you from disease found on birds and in bird droppings. Use a plastic bag to catch the nesting material. Put on a breathing mask and a pair of rubber gloves. Pull the birdhouse down and dismantle it if there are any parts that slide off. Empty out the nesting material entirely, placing it in a plastic bag to be thrown away. Create a solution that is 10 percent bleach and 90 percent water and use it to scrub the birdhouse. Rinse the birdhouse thoroughly and allow it to dry. Reassemble the birdhouse and replace it, or put it away for the season. Clean your birdhouses outdoors. Parasites may be found in the nesting material and they readily infect indoor location. Instead, seal the nesting material in a plastic bag and dispose of it outside of the home.